Successfully Added iNew Mini 1 Credit Card Phone - Quad Band GSM, Bluetooth Support, Camera Trigger, MTK6261D CPU (Green) to your Shopping Cart. This mini phone only measures 4 mm so it’s really thin and light and can even fit into your wallet. Despite the mini phone’s small size, it comes with a convenient and bright OLED full view display and a really convenient touch dial pad. The iNew Mini 1 comes with quad band coverage: GSM 850/900/1800/1900MHz and will always let you stay connected. Its small size and light weight lets you take the phone absolutely anywhere – you can simply slip it into your pocket, wallet or business card holder. In a bright green color, the mini phone is a stylish accessory as well – so that you can proudly display it anywhere, wowing friends and colleagues. The phone is fully functional on its own – you can use it to make calls, send messages and more. With Bluetooth support, the phone can easily connect to other devices supporting Bluetooth. So, feel free to sync it to your other phone, an external speaker, Bluetooth headphones, mp3 speakers and more. If your primary phone runs on Android, you can also use it a remote camera trigger for your phone. This mini phone will give you up to 2 hours of continuous talk time and 4 hours on standby with its 320mAh battery. The phone can be charged through the standard micro USB interface – which comes included in the package – so you won’t need any extra mini accessories. 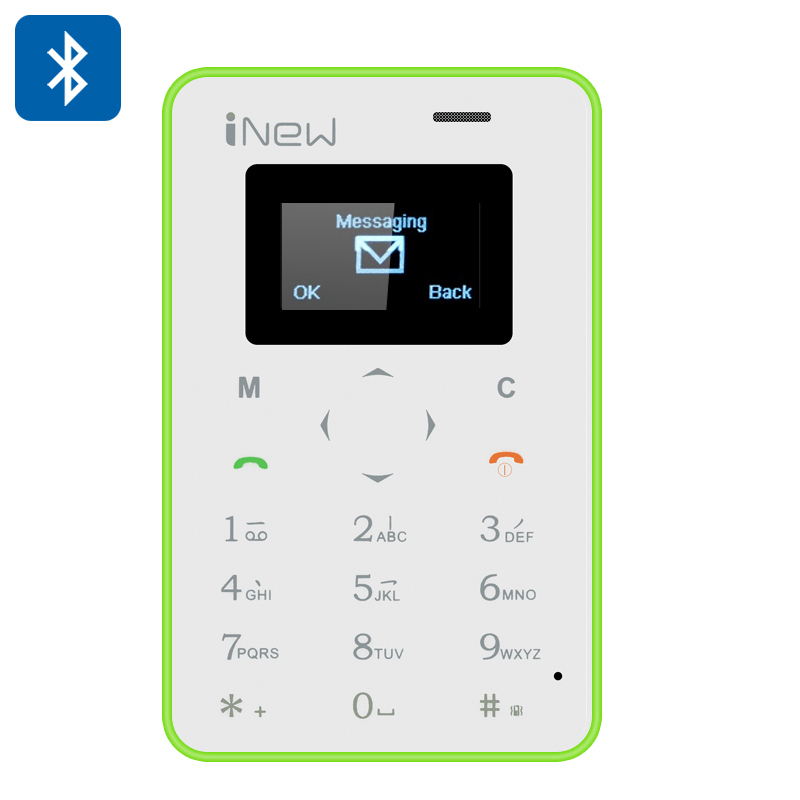 The iNew Mini 1 Quad Band GSM Phone comes with a 12 months warranty, brought to you by the leader in electronic devices as well as wholesale GSM phones..